48% of internet users have been to video-sharing sites such as YouTube; The daily traffic to such sites on a typical day has doubled in the past year. The audience for YouTube and other internet video sites has risen sharply the past year. Nearly half of online adults now say they have visited such sites. On a typical day at the end of 2007, the share of internet users going to video sites was nearly twice as large as it had been at the end of 2006. These results come from a survey of 2,054 American adults (age 18 and older) conducted between October 24 and December 2, 2007. The number of internet users asked the video-sharing question was 1,359. The margin of error on the sample of internet users is plus or minus 3 percentage points. 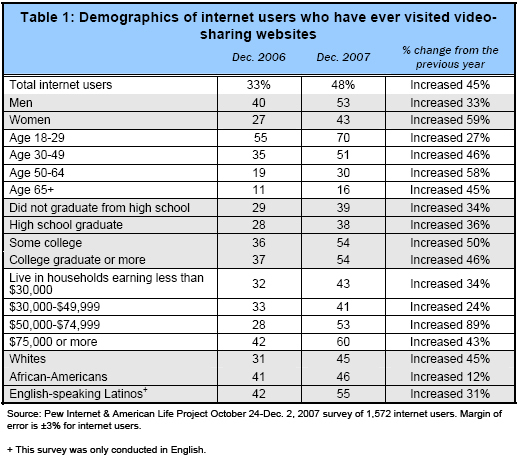 The dramatic growth in the population using video-sharing sites is tied at least in part to the popularity of such sites among men, younger adults (those under age 30), and college graduates (see the table on the next page). Nearly a third of wired young adults (30%) watch a video on a site like YouTube on a typical day and fully a fifth of online men (20%) do the same. and high school graduates, whose use on a typical day grew from 5% to 13% (or an increase of 160%). Growth in traffic is also linked to the spread of broadband connections. In our December 2006 survey, 45% of all American adults said they had broadband at home and in this most recent survey, 54% of all adults have high-speed connections at home. Other factors are almost certainly at play in the growth of video site usage. One element is that there are more videos on sites like YouTube now than there were a year ago. Some of that growth comes from people posting their own amateur videos on such sites. In our most recent survey, we found that 22% of Americans shoot their own videos and that 14% of them post some of that video online. That is more than triple the percentage of video takers who said they had posted videos when we asked a similar question in a survey taken February-April in 2006. The growth in sharing site usage also links to a larger story on the internet about widespread use of video offered by all kinds of websites. This phenomenon was documented in our report “Online Video” (https://www.pewinternet.org/Reports/2007/Online-Video.aspx). The Pew Internet Project is a non-partisan, non-profit research center that examines the social impact of the internet. It is part of the Pew Research Center and is funded by the Pew Charitable Trusts.